These have been the Dog Days of August, and thanks to Lars Vilks and his drawings, the last day of the month is the doggiest of them all. the most intresting thing about this whole Mohammed issue is what it reveals about European psyche and mentality. Firstly, the way in which the classic: “This is a free country with freedom of speech so can all you protesters please shut up”-mentality has survived from colonial times amazes me. What does it mean when the Swedish Prime Minister comes out and says “We do not want to interfere politically in what is published”? And here comes the second issue which all of you Europeans seem so fond of. The whole Jewish-Muslim dichotomy which you have concurred up to legitimize your actions is creative but insulting. For Muslims the Jewish example is one way to illustrate the hypocracy in Western mentality. The way in which you allow certain things to be common sense, like perpetuating Jewish stereotypes and sometimes (but rarely) other racist material, but the way in which Mohammed and Islam has fallen under political correctness and therefore there to be challenged. Why do we not challenge our perceptions of the Holocaust or “the Jews” ? Everything is political. And Politics is man’s relationship with Power. Some however are closer to power than others. Muslims, and really all non-white/non-male/non-heterosexual people in the world, have since the beginning of Western hegemony been represented, spoken for and rationalised by their subjects. The West divided state and church and began its quest to do so in other places, saw a mosque called it a church and has been dividing since. This form of ethnocentric criticism of the Other is most visisble in the western liberal feminism and it’s criticism of Third World countries (or rather non-Western countries). This ideology assumes the issues facing women as the same, shared experience of women is said to be represented by White heterosexual middle class women, i.e. boredom in the household, man as the enemy holding the woman down, keeping her in the house etc…What all forms of Western colonial mentality (and western liberal feminism is one part of it)ignores is the way in which They in fact are the enemy of many non-white women, western imperiailsm is the most common enemy, not male oppression (husbands are often allies in the struggle against imperialism). So for you, Lars Vilks, to assume that you are acting rationally and according to the fundamentals of democracy and freedom of speech is something we (non-Westerners) have heard since the dawn of Western hegemony. Islam is not the same as Christianity, it is only in the West which the word Religion has clouded imperialist minds. Islam has been, and is still today one of the very few alternatives which exists on fields outside of Western hegemonic spheres. For you too challenge the way in which Muslims see their religion (or lack of sarcasm which you call it) is therefore not new to us. It is the good old ‘mission civilatrice’, as the spread of ‘modernism’, ‘secularism’, capitalism and other sisms which you, the West, once in a while decide needs to spread. You right to do so is there, and our right to protest is here as well. But we are not fighting on equal terms, you have the Archers of the Empire and the Cavalry of Neo-Colonialism on your side guarded by the Assasins of Representation. We are the army of the Wretched, with pitch forks and daggers, larger in number but stand no chance. Please Lars Vilks, remember this. Read some Chandra Mohanty, Frantz Fanon, Albert Memmi, Ngugi Wa Thiong’o. Empatize with us, realise what you are doing. You Art itself might not mean what you think others misrepresent it as. But you Art is not empty, it does not exist in a vacuum but it is like slave ship which in itself in not racist, your Mohammed as a dog is loaded with the cargo which continues hundreds of years of oppression and misrepresentation. Do these sound like they were drawn from the Koran? One detects the discordant themes of PoMo deconstruction in these catchphrases. The post-colonialist theme music could be taken directly from Edward Said, and it’s no surprise to see Frantz Fanon’s name in there. The other authors mentioned — Chandra Mohanty, Albert Memmi, and Ngugi Wa Thiong’o — are singers in the same choir, the revolutionary/anti-imperialist/feminist/Marxist medley that has become all too familiar in West for the last forty years or so. Arash Sedighi is almost certainly an Iranian. Arash is a famous figure out of Persian mythology, and is often used as a first name, and “Sedighi” is a common surname in Iran. A Google search on the name turns up a student representative in the School of Oriental and African Studies at the University of London, and, interestingly enough, there is more than one reference from the southern Swedish town of Malmö. An SOAS connection would make sense, given the anti-colonialist jargon in Mr. Sedighi’s comment. And it also makes sense that he is coming at Lars Vilks from a Leftist perspective. As I mentioned in an earlier post, Lars Vilks is a traditional Left-Socialist, who by his recent actions has betrayed his co-religionists in the Church of the Left. Mr. Sedighi’s comment should be considered a call from a fellow Marxist to return to the fold. Just a friendly warning, man-to-man. It’s not clear what part Islam plays in this. Maybe it’s the muscle; the designated enforcer of leftist orthodoxy, called in to help persuade an apostate to reconsider. But it’s also another indication that the Left and the Islamists are good buddies, the closest of fellow travelers. Oh, No! It’s Happening Again! The Modoggie crisis is escalating according to schedule. 1. Protests by other Muslim governments. 2. Narrowly-focused rioting in selected cities of the Middle East and South Asia. 3. Sweden caves in, suppresses Vilks, and apologizes to 785 quadrillion Muslims. 3. Sweden refuses to cave, and the conflict escalates further. It looks like we are up to #2, which is playing out right now in Pakistan. According to this news story, demonstrators in Lahore burned a Swedish flag. Demonstrators in Lahore, Pakistan, burn the Swedish flag today in protest against the publication of a drawing of Mohammed. It seems that Lahore must lack the deep blue color of paint required to make a Swedish flag, because the flags in the photo are distinctly green. Notice the sign, in English: “Down with Swed[en] — Death to Lar[s Vilks]”. We are definitely entering a reprise of the Motoon crisis. Back in the early days of the Modoggies, I said that the trouble wouldn’t really start until the news hit the MSM, and then all hell would break loose. It looks like that’s the way it’s playing out. Sweden is reaching the fork at #3, and so far it seems to be following the Danes’ example, and refusing to cave. This story, if it follows the Motoon template, may blow up very quickly, and here at Gates of Vienna we may lose track of it. But I’ll keep you updated as best I can as more information flows in. Hat tip: CG, yet again. Update: Carpenter has sent us a link to a video report on the demonstration. It’s in Swedish, with no subtitles, but you can get a look at the crowd, which seems bigger than last week’s. One of the signs reads “This is an attack against all Muslims” (my translation). “There have been many threats. It’s about several death-threats via telephone, e-mail, and comments on my blog,” says Lars Vilks to TV4. The Islamic Cultural Centre said it was protesting against the newspaper’s decision to publish a drawing by artist Lars Vilks, whose series of pictures depicting the Muslim prophet Muhammad as a dog was rejected by galleries in western Sweden. So what is it about Fridays? Do they get all fired up by the imam’s Friday sermon at the mosque? Or is there another reason for the scheduling? But not everybody in the Swedish Muslim community has applauded Friday’s demonstration — the second in the space of a week. “I think the demonstration is counterproductive and will only serve to reinforce any prejudices people have about Muslims,” Mohamed Omar, the editor of Minaret magazine told The Local. That’s not what the magazine said a couple of weeks ago. Regular readers will recall that Minaret offered to co-sponsor an exhibit of the Modoggies, all in the name of freedom of speech. The Islamic Cultural Centre was not the only group protesting outside Nerikes Allehanda‘s offices. An hour earlier, representatives from the Liberal Party’s youth wing showed for a demonstration in support of freedom of expression. “We are doing this to protect freedom of expression and freedom of the press. It has come to our attention that there are people don’t think people should be able to say what they want and that makes us angry. Freedom of expression is absolutely central,” spokeswoman Hannah Ström told TT. Several Swedes and Danes are keeping me up to date with breaking news on the Modoggie caper. There will be undoubtedly be more information later. The Arabs have unleashed the dogs of war — in the war of words, anyway. 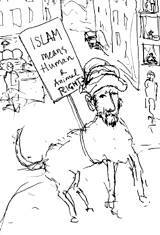 Now the OIC has weighed in against Lars Vilks’ blasphemous Modoggies. 5.65 sextillion Muslims are really, really angry. Their feelings are grievously hurt. The Organization of the Islamic Conference yesterday condemned the publication of a blasphemous caricature of the Prophet Muhammad (pbuh) by Swedish artist Lars Vilks in the Nerikes Allehanda newspaper. The Swedish daily published the drawing, part of a series by Vilks, last Friday after art galleries had declined to display it. The newspaper argued the publication was in the defense of free speech. OIC Secretary-General Ekmeleddin Ihsanoglu strongly condemned the newspaper for publishing the blasphemous caricature and said that this was an irresponsible and despicable act with mala fide and provocative intentions in the name of freedom of expression. He said the caricature was intended to solely insult and arouse the sentiments of Muslims of the world. He called on the Swedish government to take immediate punitive actions against the artist and the publishers of the cartoon and asked for their unqualified apology. He also called on Muslims to remain calm and to exercise restraint. Isn’t that an example of what your shrink would call projection? Isn’t that what the leader of any Arab government would do if one of the newspapers in his country offended him? Prime Minister Fredrik Reinfeldt has spoken out about the need for Sweden to stand up for press freedoms following the controversy surrounding the publication by a local newspaper of drawings of the Muslim prophet Muhammad. “We are also eager to stand up for freedom of expression, which is enshrined in the constitution and comes naturally to us, and which ensures that we do not make political decisions about what gets published in the newspapers. I want to make sure we keep things that way,” Reinfeldt told news agency TT. Good for him. Let’s see how long he can hold the line. You can be certain that the angry Muslims are not done with him yet. Hat tips: CG and KGS. First, a disclosure: I was sent this book for the purposes of review by Free Press, a subsidiary of Simon and Schuster. A free book is always a joy… this review, while difficult to write, was also… enjoyable?… enlightening? Perhaps the best description is “memorable,” for his story will remain with me for a long time to come, not just for the way he renders a literal fight for his life — though that must have been something to behold — but for his humanity. I don’t pretend to be a military expert, either as a historian or a student of strategy and tactics. My field of interest is the human condition: how we meet life’s exigencies and either surmount them or succumb to their burden. The mystery of the human character fascinates me. It is from that perspective that I read this memoir and it is also from there I report to you my observations. So… meet former Staff Sergeant David Bellavia, an infantry fighter and survivor of the second offense against Fallujah in November, 2004. His time in that circle of Hell earned him the Silver Star and the Bronze, plus recommendations for the Distinguished Service Cross and the Medal of Honor. No doubt any soldier would identify with Bellavia’s story. On the other hand, any adult who has skirmished with the devilish memories of his family of origin (and won a few rounds) will see himself or herself in this soldier’s shame and glory. Sergeant Bellavia’s motives for volunteering for military service are as complicated as any other man’s life choices. Some he tells you — as in the incident of a home invasion his family experienced — and others can be inferred from his talks with fellow soldiers. One good part of the narrative is that it is layered, but not all laid out for you. Some things you have to figure out for yourself, some things you must assume. You hear about his shame early on and it prepares you for his eventual encounter in hand-to-hand combat with a mujahid in a house in Fallujah. This battle to the death, fought in total darkness, seems brutally eternal. You know he lives, obviously — you remind yourself that you’re reading his version of the story after all — but it doesn’t seem as though he could have survived this ordeal. I have had PTSD for many years, so I am careful what I expose myself to since I trigger so easily — though it has improved as I’ve gotten older. Still, I am careful. Had I known the story Sergeant Bellavia would tell, I probably would have avoided the book, based on my previous encounters with violence. However, his story is so carefully rendered that I got through it and was better off for having done so. I’ll never forget the images his words created for me. Having lived through the extremities of Fallujah and the concomitant bond created with his fellow soldiers under fire — especially the men for whom he was the NCO — life in the outside world probably pales by comparison for the Sergeant. He wrestled manfully between family or life as a soldier. In the end, his responsibility to his son won out. The challenge this little boy, Evan, presents for him is every bit as difficult as his encounter in the murderous darkness. Still, civilian life seems black and white in comparison to the bloody confines of Fallujah. Sergeant Bellavia has his work cut out for him. One way he has devised to make this transition is to focus on Vets for Freedom, an online group which he co-founded in order to fight the twisted tale the MSM generates out of its own need to make Iraq and Afghanistan into other Vietnams. The boomers don’t own this war, but they are trying mightily to abort it. In our time, it is difficult for a man to make his way through the thickets of modern life with his manhood intact. Bellavia has done that, and has paid the price for it. True manhood is never free. Visit the website. It’s crisp, easy to navigate and full of information. Congratulations to those who designed it. By the way, to see a contemptuous review of the book by Publisher’s Weekly, click the Amazon site. And remind me to take Publisher’s Weekly with a grain of salt in the future. … At least Amazon didn’t leave it at that. There are currently no reader reviews, though there are professional soldiers’ blurbs below the kick in the pants Publisher’s Weekly doles out. If you’ve read the book, go over and give your opinion. I’m glad I experienced this story. Thank you, Free Press. NB: when the Baron and the fB have finished reading "House to House", I'll pass the book on to whomever writes first. However, I ask that you, in turn, pass it on to someone else. Geilenkirchen is a modest German town in the state of Nordrhein-Westfalen, hard on the western border with the Netherlands. Just outside of Geilenkirchen is a NATO airbase named after the town. Geilenkirchen Air Base is home to NATO’s E-3A AWACS aircraft and their support systems . The Airborne Warning and Control System (AWACS) is designed to carry out airborne detection and surveillance of enemy missiles and aircraft from a great distance. Seventeen E3-A AWACS aircraft are based at Geilenkirchen. Not surprisingly, Geilenkirchen, like so many other NATO installations in Germany, has repeatedly been the focus of European anti-war demonstrators. In 2003 German Indymedia reported that about 500 demonstrators attempted to blockade the airbase, demanding the removal of all NATO AWACS aircraft. Needless to say, security is a major concern at the Geilenkirchen base. AWACS technology and deployment are sensitive topics, and various foreign powers would have a strong interest in finding out some of the details about what goes on inside E-3A WAWACS aircraft. The Hague, 29 August(AKI) — Two Dutch women, have lost their jobs at a NATO base in Geilenkirchen over their mysterious marriage to Muslim men which took place during a holiday in Tunisia, the NIS Dutch news service reports. Both women — who were identified only by their first names Patricia and Gerda — had a level of security clearance that would have allowed them to access possible NATO secrets, the NIS report said. Following their weddings in Tunisia to local men who they met on while on holiday to the North African country in 2007, the Dutch General Intelligence and Security Service (AIVD) withdrew the women’s NATO security clearance. According to a report by the Dutch daily De Telegraaf, the two Tunisian men were classified as “extremely high-risk”. Although it is not clear why the men — whose names were not published — are classified as high risk, their marriage was described as “suspicious” by officials at the Geilenkirchen base, home to 17 AWACS surveillance planes — used against aerial terrorist threats. “These ladies have worked for us loyally for years, so why should I not give them moral support? I am not aware of any wrongful actions”, he was quoted as saying. Well, naturally, she is suing. Who wouldn’t? The possession of a top-secret security clearance is, after all, one of the basic human rights guaranteed by the EU constitution. How did Dutch intelligence get onto these two “boys” so quickly? How did the two women meet their future husbands? Were they recruited for their mission in the Netherlands before their holiday in Tunisia? If so, what network was involved? I have no answers for any of these questions. If any of our Dutch readers know more about this affair, please feel free to hold forth in the comments. Pakistan on Thursday condemned in strongest terms the publication of a blasphemous sketch of the Holy Prophet Muhammad (peace be upon him) in a Swedish newspaper ‘Nerikes Allehanda’ in Örebro city. Sweden’s Chargé d’Affaires was summoned to the Foreign Office by Additional Secretary (Europe) and strong protest was lodged with him, a Foreign Office press release said. The Swedish Chargé d’Affaires was told that the publication of sketch had caused grave affront to the religious sentiments of Muslims. “The government of Pakistan expects greater sensitivity on part of Swedish government on this issue,” the Swedish diplomat was told. Pakistan will also hold consultations with the Organization for Islamic Conference (OIC) to determine the future course of action against the repetition of such provocative publications in future. Pakistan will continue to work with like-minded countries in the United Nations to find ways of addressing the recurring issue of defaming Islam and its sacred personalities. Regrettably, the tendency among some Europeans to mix the freedom of expression with an outright and deliberate insult to 1.3 billion Muslims in the world is on the rise. If you believe this account, the official Swedish government line has changed. It now agrees with the “Muslim community” and regrets the publication of the Modoggies. Is this the first sign of a full capitulation? Lars Vilks, of course, is unrepentant. He seems totally insensitive to the 313 quintillion Muslims on the planet who are furious with him, and turns out a new drawing of a Modoggie every time someone complains. 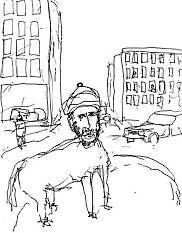 On his Tuesday blog post, as a response to last week’s demonstration in Örebro, Mr. Vilks drew this latest incarnation of Mohammed as a roundabout dog. It’s good to see a Modoggie taking an interest in political activism. Maybe it will serve to raise his profile in the MSM. It’s also good to see Mr. Vilks labeling his signs in English — it saves our translators some work. Hat tips: CG and LN. I recommend the rest of the story, complete with Clinton’s assessment of the future (now past) found here. The text is no longer available on the magazine website. Question: When will world leaders ever change their tune about Palestine? This is a case of willful blindness combined with political speak. Clinton has nothing to lose now; why can’t he step up to the plate and tell the truth?…oh, right, he’s hoping to be First Lady. This post is the latest in a series from our Bangkok correspondent, H. Numan. Insurgent attacks on state schools and Thai-Buddhist communities have claimed more civilians lives in the past two days in the deep South, provincial officials said Tuesday. The fresh wave of violence coincided with the launch Tuesday of a 104-page report by the New York-based Human Rights Watch which roundly blasts the southern Muslim separatists for targetting civilians in its political struggle. Two public school teachers were gunned down on Monday in Pattani, 720 kilometres south of Bangkok, and six other Thai-Buddhists slain Monday and early Tuesday. “The insurgents have shifted their tactics from beheading villagers to targetting public school teachers,” said Pattani Governor Panu Uthairat. Altogether 69 teachers have been killed in Thailand’s southern conflict over the past three years and eight months. Female teacher Kesine Timthep, 42, was shot dead Monday in front of her pupils by two gunmen as she was about enter the Sasanasuksa School in Sai Buri, Pattani. A male teacher was also gunned down Monday in Yalang, also in Pattani province. Arsonists set fire to at least five state schools in the province Monday night, forcing ten schools to shut their doors to pupils on Tuesday. Prapaijit Noonlaksert, 44, a female rubber tapper, was killed in an ambush early Tuesday as she entered a plantation with four other Thai-Buddhists workers, police said. “The recent wave of attacks may be in revenge for all the suspects authorities have arrested in recent weeks,” said Panu. Thai authorities have rounded up hundreds of suspected insurgents in the past three months, keeping many of them in detention under powers allowed by an emergency decree enacted in the region. Some 2,500 people have fallen victim to an escalating separatist movement in Thailand’s three southernmost provinces of Narathiwat, Pattani and Yala, since January, 2004, when the conflict took a militant turn for the worse. The New York-based Human Rights Watch on Tuesday launched a 104-page report on the conflict that sharply criticized the separatists for their increasingly brutal attacks on civilians. The report identifies the Pejuang Kemerdekaan Patani, or Patani Freedom Fighters, in the loose network of National Revolution Front-Coordinate as the backbone of the new generation of Muslim separatist militants. Of the 2,463 people killed in attacks during the past 40 months, some 89 per cent or 2,196 victims were civilians, it said. At least 29 of the victims had been beheaded. "An Urgent Appeal for help from Regime Change Iran"
I am writing you with this urgent appeal because you have contributed to our work in support of the Iranian pro-democracy movement in the past. Our website has been shut down due to lack of funds. As you know, our website suspended its reports several months ago in order to regroup, with hopes of coming back bigger and better than ever. Even without posting new articles our site has been regularly receiving thousands of visitors seeking our “hard to find reports”. Until we can pay our past due expenses of over $1,000 the website will remain closed. There has never been a time when the Iranian pro-democracy movement needed our support more with help getting its message out to the western world. Over the past few months, we have been working on redesigning our website with hopes of launching a major new internet campaign in support of the pro-democracy forces inside of Iran. If we receive sufficient funding we will implement the redesigns and resume our reports. But unfortunately, without your financial support this will not be possible. We need the help of you, our supporters, in order to keep our website up and running. If you can once again help us through this emergency it would be greatly appreciated. Then click on the “Send Money” tab. Paypal now accepts credit card donations. Remembering all the kindnesses of our readers when the Baron was unemployed, I thought to ask again, this time in the name of Regime Change Iran. Tell Gary the Baron sent you! I have been an avid reader of your forum for over a year now. Recently, due to an injury I have been laid up in bed unable to do much more than read and surf the net from my laptop. Spending the last month reading various sites and blogs has brought me to write the attached essay in memory of Etgar Zitoune - a friend murdered by the Oslo accords. I thought it might interest your readers to hear a point of view from someone who grew up in Australia and lived in Israel for 12 years. When I went to live in Israel during the early 1990’s, I fell in love with the country. Vibrant people, a country full of extremes, a country filled with people of passion. I loved to walk in Jerusalem. There, on the sidewalk, I met with people dressed in the manner of their religion, The Coptic priest, the Armenian priest, the orthodox Chasidic Jew, the Muslim mufti. The contrast between the Gay Parade in Tel-Aviv on the one hand, and the nation-wide observance of Yom Kippur on the other, inspired me. The Gay Pride Parade of Tel-Aviv had all the pageantry that you would expect of such an event, a true celebration of Hedonism. And Yom Kippur embodied what you would expect in a Jewish country: the mad rush to get home before the siren sounded signifying the beginning of the holy day. Perfect silence would descend; there was not a single car on the road. Unless you have experienced it, you cannot imagine how magnificent it is that a whole country comes to a stop. Even the most irreligious of Israel respected this tradition. I am not saying that the Orthodox did not complain and protest the Gay Pride parade; it was their religious obligation to do so, and in a free society it is their right. However, their right to protest was respected, and so was the right of free assembly of the gay community to hold their parade. The successful resolution of the tension between these two extremes are one of the features I loved about Israeli life. When the Oslo accords were signed I was ambivalent. However, I said, “who knows, maybe…” I was of the mindset that if you give a sixteen-year old boy an education and the choice between partying (and hopefully a chance of, you know, getting to second base with a girl) or blowing himself up, then this adolescent would choose life. I thought, “who knows maybe this will be the beginning of normalisation of relations with our neighbours. After all we ultimately all care about the same things - putting a roof over our family’s head, feeding them and spending time with them. The line from an old Sting song came to mind: I hope the Russians love their children too.. I knew from experience that our cousins loved their children because both in Israel and in Australia my Muslim friends showed the same devotion to their children that I have for mine. My father-in-law was living with us at the time and he used to ask me why I didn’t want peace. My response was that I would chop off my right arm for peace but I was not willing to slit my throat and kill my children for the peace of the grave. Of course, I didn’t really believe that peace would happen. My father-in-law accused me of being a pessimist, and then pronounced upon me the worst insult an Israeli can mutter: I was right wing (which was ironic as my father always accused me of being a Socialist). I asked him what he would do as a businessman if a person he went into partnership with did not fulfil a single one of his obligations as agreed upon in their contract, while he, in good faith, had begun fulfilling his part. His immediate response was that he would dissolve the partnership. I then asked him what he would do if his partner had a “valid” excuse for not fulfilling the first criteria, saying he needed more time. My father in law said that if it was valid, he would let it slide. I went on: what if his partner offered a valid excuse for the second and third and fourth criteria. My father-in-law said, “well at some point business is business and I should not have to carry someone who is unable to fulfil his part of the contract.” So I asked him to point out to me one thing that Palestinian leadership had done do fulfil their obligations. “That is different,” he said. I cannot tell you how often in Israel I heard the words, “How can you think like that? You are an intelligent, educated, thinking woman.” I was told that I was racist for thinking that peace with our Muslim cousins was unattainable. One of my best friends, a beautiful gentle soul who also happened to be gay, was the most confused by my attitude. Here I was a believing Jewess, fighting for animal rights, chaining myself to trees, fighting for honesty in Government and so on. He could not reconcile my general humanistic demeanour (which, by the way, is very much in keeping with Jewish law) and my adamant stance that Israel was committing suicide in its policy of appeasement and rewarding terror with more concessions. He was constantly trying to explain to me the error of my ways. And then my gentle friend, together with his cousin, was murdered while visiting an Arab village. An Arab friend of ours was with them and he begged the murderers to leave his guests alone as they were with him (up until that point, under the honour system that Arabs had if you visited an Arab village accompanied by an Arab you were safe). The killers placed the gun by the side of my friend’s head and shot it off. They told his Arab friend that if he didn’t shut up he would be next. Here’s another difference between our culture and that of our Muslim cousins: in the early nineties there was a rash of terror attacks that took the form of knifings. One such attack took place in Tel-Aviv. Immediately, the attacker was set upon by angry Israelis. After they disarmed him, they began beating him. A woman - I think she may have been religious - threw herself between the mob and the terrorist. “We are a rule of law, not a bunch of thugs,” she said. They stopped. She did what she did knowing full well that the mob would not attack her. So while my friend and his cousin were dragged out of the restaurant where they were eating, no one except for our Muslim friend moved a muscle. I do not believe their failure to react was due to indifference. I believe that those also in the restaurant did not interfere because they knew full well they would suffer the same fate if they said anything. They did indeed live under the tyrannic rule of a bunch of thugs. What are the politically correct left really saying? I believe this is true not just of Israel but of Europe and the rest of the “enlightened West.” They are saying, “let us humour these Muslims. Eventually they’ll get it. I mean who wouldn’t want to be like us - the freethinking, enlightened, wonderful West where everyone is equal, and everyone is free to think and do what they like? Come on, you Muslims can’t really want to live in the prison of that seventh century way of thinking. We of the “enlightened West” are so evolved that we will treat you like three year olds and put up with your tantrums until you mature and grow up.” This kind of thinking is patronising; it is arrogant. So now I know what they don’t want. They don’t want to be like us at all, and they are willing to kill their children to prevent that from happening. I decided to translate a report by Upplandsnytt (Sweden’s state public radio’s local news in Uppland, Sverige) from yesterday. Apparently, Uppsala’s local newspaper Uppsala Nya Tidning has published Mohammed too. Hence, the “Arabic Cultural Association” forms an anti-free speech committee. 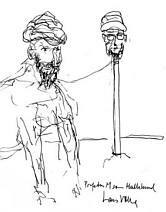 Yesterday in Uppsala, Muslim associations and congregations formed a committee for planning protest actions against publication of drawings of Mohammed similar to those drawn by Lars Vilks. Among others, Uppsala Nya Tidning has published Mohammed as a roundabout dog, which has angered many. For instance Yiha Abu Sakaria [Don’t know if my spelling is correct — translator] of the Arab Cultural Association in Uppsala. 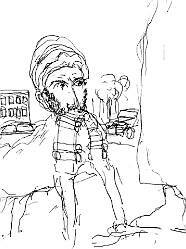 The caricature drawings by Lars Vilks which have been published in many papers, among them Uppsala Nya Tidning, have raised emotions among many Muslims. Yesterday the Iranian government sent a formal protest of Nerikes Allehanda’s publication, and a committee was formed in Uppsala in order to protest against further publication. For instance, they want to meet UNT’s editor-in-chief. He is saying that you abuse the freedom speech and press and insult people and their religion. What refreshing common sense from this Swedish newspaper editor! But why repeat what happened in Denmark? Why indeed? What good would displaying a spine do the Swedes? After all, the only thing it did for Denmark was to reduce Muslim agitation and harden public attitudes against further Islamization. And who wants that kind of racist thinking in Sweden? The Belgian Council of State has surprised everyone (especially me) and ruled speedily on the matter of the SIOE demo. Its promptness is probably explained by the fact that it has decided against the demonstration, backing up the mayor of Brussels. The authorities apparently decided that they were able to understand SIOE’s appeal after all, despite the fact that it wasn’t delivered to them in French. Go over to Brussels Journal and read the rest. As I mentioned earlier today, plenty of disgruntled Europeans are going to show up in Brussels on 9-11, despite Mayor Thielemans and the Council of State. 1. How many will be there? 2. How will the Belgian authorities respond? The blogger Vanishing American continues what is gradually becoming one of the most important discussions of our age: What role does, or should, Christianity play in Western civilization? Is it the bedrock of our culture, as Robert Spencer of Jihad Watch thinks, and is our decline associated with abandoning it? Or is Christianity, as Derbyshire puts it, a religion for once and future slaves, an ideology that is now fueling globalist ideals and undermining our borders through mass immigration? The Christian/Non-Christian divide is perhaps the most difficult divide to overcome within the West today. I’m struggling with this myself. Some of the criticism of Christianity, or at least the way many Western Christians are behaving now, is legitimate. I have heard Catholics claim that Multiculturalism and Political Correctness are tied to Protestant culture. I’m willing to consider that possibility. There are significant doctrinal differences between Catholics and Protestants regarding redemption and the sinful nature of man. Maybe some of this is tied to the Protestant concept of “salvation through Faith alone.” However, when it comes to just plain old-fashioned dhimmitude and abandoning national borders, Catholics are at least as bad as Protestants. The Second Vatican Council from the 1960s was good for reaching out to Christians of other denominations, Protestant and Orthodox, and for reaching out to Jews. The problematic aspect is in relations to Islam. The big Achilles’ heel of Christians in general, and of Jews, when confronted with Islam is the idea of a “shared community of monotheists worshiping the God of Abraham.” As long as this myth is maintained, Christianity can actually in certain situations be a bridge for Islam to enter the West, rather than a bulwark against it. I have seen more than once Christians making common cause with Muslims as “men of faith” against the godless forces of secularism. I notice, however, that Christians hardly ever do the same with, say, Hindus, so it must have something to do with a shared sense of monotheism. Christianity is growing fast in South Korea. It is interesting to see how newly converted Christians react in non-Western nations. I’ve been critical of Christianity sometimes because it is one of the impulses behind the Western inability to protect our borders, and it is. But it is Christianity within a specific cultural-ideological context that reacts like this. Koreans don’t have the same problem, as far as I know. Nor did we, until the 1960s and 70s. So what changed? It can’t all be related to Christianity, can it? These days we hear so many arguments against Christianity, such as from the ‘proselytizing atheists’ like Dawkins and Hitchens, and then we hear the arguments from the secular right which attack Christianity for being too pacifistic. The atheists claim that Christianity fomented violence, and that it is as militant and bloodthirsty as Islam, or in fact worse, and on the other side, we hear that Christianity is a religion of slaves, which weakens and emasculates the West. So Christianity gets it from both sides; it’s too militant, it causes wars and persecutions, and at the same time, it’s a religion that turns men into milquetoast pacifists. Does this make any sense? Christianity contains elements of both militancy and pacifism, but it is not one or the other. We know that our forefathers did not believe Christianity commanded them to be pacifists, or to erase borders and nations. To assert that they, for centuries, were wrong and that we are the first generation to really understand Christianity and the Bible is arrogant in the extreme. If anything, we today, on the average, are far more ignorant than our ancestors where the Bible and the faith are concerned. If anybody is wrongly handling the word of God, it is likely to be us, not our forefathers. Their brains were at least not addled by nonsense and Political Correctness, and I trust the consensus of our forefathers through the centuries rather than the consensus among today’s compromised generation. In this regard, the evangelist, fundamentalist churches are no better than the liberal ones. I once attended a presentation at a nearby Pentecostal church about Third World poverty. The cause? Lack of infrastructure. All we had to do was dig deeper into our pockets and the problem would be solved. I’m sorry to say this but the cause is deeply rooted and largely intractable, at least in the short term. We will not help the world’s poor by welcoming them to our shores. We will simply destroy ourselves in the process. John Derbyshire is more right than wrong. Yes, medieval Christianity had no qualms about resisting invaders, but medieval Christians (as Protestants love to point out) had adulterated their faith with pagan beliefs. Over the past few centuries, Christianity has stripped itself of its pagan accretions. In the process, it has become as much a threat to ourselves and our loved ones as Marxism used to be, if not more so. That sounds like a harsh judgment. It is. You Want Justice? Speak French! As has been widely noted, the mayor of Brussels, Mr. Freddy Thielemans, has denied a permit for the 9-11 demonstration in his city. The demonstrators are gathering to Stop the Islamization of Europe, and, as a result, Mayor Thielemans cannot guarantee their safety from violence at the hands of the city’s Muslims. Kind of proves their point, doesn’t it? The organizers decided to appeal against the ban before the Council of State. Today, the Council of State decided to postpone its verdict until it has decided whether or not the appeal, which was presented in Dutch, one of Belgium’s two official languages, should have been presented in French, Belgium’s other official language. When Udo Ulfkotte, the German organizer of the demonstration, filed his initial request for the demo he was told by the mayor’s office that he had to do so in French, which he did. Ulfkotte told us that, being a foreigner, he was not aware that he could also opt for a Dutch-language procedure. Now the Brussels authorities demand that he should stick to French and that the case should be brought before French-speaking judges of the Council of State. Dutch-speaking (Flemish) judges are more favourably inclined towards defending political freedoms than French-speaking (Walloon) judges. The Council of State judges are political appointees. Flanders, the Dutch-speaking north of Belgium, is free-market oriented while Wallonia, the French-speaking south of the country, is Socialist-dominated. Now the official strategy becomes clear: route the appeal into the socialist French-speaking part of the state apparatus, where sneering contempt of the Flemish-speaking majority is the norm. Go over to Brussels Journal to read the rest. Mr. Belien speculates that the authorities may decide the case as late as September 10th, leaving the organizers just one day to prepare for event. However, the word through the grapevine is that people all over Europe are not waiting for the official decision; they’re already making their arrangements. However, whether or not the demonstration will be permitted, Europeans who oppose the islamization of their continent will convene on Tuesday 11 September at 12 am (noon) at the Schuman Square (Rond-Point Schuman), in front of the Berlaymont building, the headquarters of the European Commission, to hold one minute of silence for the victims of 9/11/2001. Those of us that are intent on being in Brussels will be there anyway. They will not stop us and they will not hinder us in our protest. We will have the final word on the day. Whether they like it, or not. We don’t need no stinkin’ Council of State! From the onset, it was obvious that no serious analysis had been undertaken with Amanpour’s ‘God’s Warriors’, broadcast this week on CNN. Conveniently packaged into a consumer-friendly trilogy, the politically-correct presentation of morally-equivalent religious fundamentalism — in Judaism, Islam and Christianity — only served to obfuscate the greatest geopolitical danger the world faces. The threat comes not from some abstract form of victim-driven terrorism, which might arise from any one of the “Abrahamic faiths”. It comes from within the global Islamic umma, from a revival of aspirations for an Islamic empire under sharia law. Central to this is jihad: holy war against the unbelievers for the ultimate purpose of reinstalling the caliphate. This is exclusively Islamic; there is simply no comparable threat to civilisation from Judaism or Christianity. Jihad is not a modern phenomenon — it dates from Muhammad’s lifetime. Jihad is the sixth pillar of Islam. Did Amanpour mention this? Of course not. She failed to inform viewers that jihad is the only theologically-sanctioned form of violence from within the three so-called Abrahamic faiths. It is not a perversion of Islam — it is clearly sanctioned in the Qur’an, and the Hadith (the “traditions of Mohammad”). It is not comparable with the Crusades or any other historical wave of imperialism — it is Islam’s internal motor, not a historical contingency. And is not a product of recent American or Israeli policy — it is thirteen centuries old. Jihad is central to the hugely influential writings of Qutb and Maududi, the modern Jihadist writers of the early 20th Century. They call for a jihad as a return to the fundamentals of Islam, not as a deviation from it. And these are often quoted, along with verses from the Qur’an and Hadith, by Jihadists today to support acts of terror. So to whitewash, in the way Amanpour did, the current spate of killings, insurgencies, and religious persecution against non-Muslims across the surface of the planet, and perpetuate the myth that Islamic terror is all a backlash against the actions of the West (and Israel), is not only wrong, it is truly disgraceful. Amanpour clearly demonstrates that she knows nothing about Islam, and by distorting the history of the Middle East conflict with such moral equivalence, she only serves to perpetuate the prevalent anti-Israel climate and our blindness to the rising tide of Jihadism. God’s Warriors cannot be considered as authoritative reporting or counted on to add anything to the debate on the “Clash of Civilisations” or the “War on Terror’. Even if you ignore Islam’s 1300 year history of conquering and subjugating non-Muslims, including Jews, the anti-Semitism embedded in the Qur’an and Hadith, and the fact that the “Palestinians” (a people fabricated after the 1967 war for Arab political ends) have rejected numerous chances to create a state in co-existence with Israel — the comparison of “radical” settlers (“Jewish God’s Warriors”) and jihadi groups such as al Qaeda (“Muslim God’s Warriors”) is truly abominable. A cursory glance beneath the headlines across the globe is enough to suggest that terrorism is not some abstract evil that is unleashed in retaliation to the grievances caused by the West, but is in fact a problem of Islamic origin. I say “beneath” the headlines since we just cannot trust the mainstream media, including CNN, to even explore this as a possibility. It is deemed too politically incorrect. But with Western media like this, we do not even need to worry about the lies and anti-infidel hatred being pumped out through media outlets in the Islamic world. CNN ought to pioneer a proper investigation of the emerging World War with Jihadists. CNN owes it to its Western audience to confront the uncomfortable reality, beyond the soundbite analysis, that faces the civilised world. Such an investigation is unlikely any time soon. Michael Moore has been in Denmark promoting his new movie Sicko, and Steen has very kindly sent me photos of his appearance on DR2 (Danish public television). But the third subtitle has me stymied, and I’m hoping a Dane will help put it back into English for us. Michael Moore seems to be all the rage in Scandinavia — as I reported last night, he was recently made an honorary citizen of Ladonia (which ordinary folk like me consider to be part of southern Sweden). I say, let’s send him to Scandinavia to stay. Don’t you think he’d make a great Viking? Pull that Rutgers cap off his head, put a helmet on him, have him grow out his stubble a bit, and put a big tankard of øl in his fist. 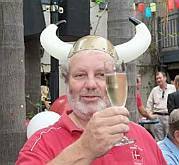 Further update: Reader SD sends this photo of Michael Moore in his future incarnation.He will, of course, have to be taught to love røget sild. We should have known. Who else could it have been? Iranian President Mahmoud Ahmadinejad has said that “Zionists” were behind a cartoon in Swedish newspaper Nerikes Allehanda, which depicted the head of the Prophet Mohammed on a dog’s body. The drawing sparked an official protest by Tehran to Stockholm. “They do not want the Swedish government to be a friend of other nations. I strongly believe they are behind it (the cartoon). They thrive on conflict and war,” he said. I imagine Lars Vilks was quite surprised this morning when he woke up and found out he was Jewish. Why hadn’t he been notified of this sooner? If Mr. Vilks responds in his customary manner, he will start drawing Mahmoud Ahmedinejad’s head on a Rondellhund. Or maybe even the Ayatollah Khomeini. A new series of specifically Shiite Modoggies would be welcome. Coming up next: The Protocols of the Elders of the Roundabout. An Islamic school in Pakistan is called a madrassa, but in the deep south of Thailand, it’s a pondok. After almost four years of battling a deadly separatist struggle against a seemingly nameless foe in Thailand’s deep South, the Thai military have learned a thing or two. Firstly, they are now convinced that the main organizer behind the violence, which has claimed more than 2,500 lives since early 2004, is the BRN-Coordinate, the political arm of the Barisan Revolusi Nasional or National Revolutionary Front. BRN-Cordinate is blamed for the January 4, 2004, raid by Muslim militants on an army arms depot in Narathiwat that made away with 300 war weapons and is now seen as the watershed for the region’s transition from a long-simmering separatist struggle into a nasty conflict with daily shootings, bombings and beheadings. Secondly, Thai military intelligence is convinced that the BRN-Coordinate has used the deep South’s Islamic schools (‘pondoks’) and religious teachers (‘ustas’) to recruit and instruct a new generation of Muslim youths dedicated to the Pattani separatist cause and a more militant form of Islam. The deep South, comprising Narathiwat, Pattani and Yala provinces, was an independent Islamic sultanate known as Pattani for hundreds of years before being conquered by Bangkok in 1786. The area came under direct rule of the Bangkok bureaucracy in 1902, and was subject to a military-led assimilation campaign in the late 1940s that sparked a separatist struggle that has sputtered on and off for the past six decades. Although the deep South has remained an essentially separatist fight, it has taken on a new al-Qaeda flavour in recent years, complete with beheadings and terrorizing civilians, partly due to the influx of a new generation of ustas to the traditional pondok school system, analysts say. The Thai military is convinced that these foreign-trained ustas, especially those from Indonesia, are at the heart of the problem. “The BRN-Coordinate has been recruiting followers from the Thai Students Association of Indonesia,” claimed Colonel Shinawat Maendej, Commander of the Army Infantry Unit 1 in Narathiwat. Shinawat told a recent press briefing that the BRN-Coordinate has for years been recruiting Thai graduates from Indonesian universities in Bandung, Jakarta and Yogyakarta, and then providing them with ideological and military training with help from the Indonesia’s Free Aceh Movement (GAM) and Jemaah Islamiah (JI) — the radical Java-based Islamic group blamed for the 2002 Bali bombing. When these graduates return to Thailand many of them find jobs at pondoks, where they recruit and radicalize youths, said Shinawat. Most southern specialists agree that there is an element of truth to the hypothesis. There have been many arrests in the deep South and many of the suspected insurgents have fingered their ustas as ringleaders. “The evidence is mounting against the pondoks and some of the radical teachers, forcing many of them to run away,” said Panitan Wattanayagorn, a political science professor at Chulalongkorn University and a leading expert on the southern conflict. Mahamu Mama, 48, alias Pador Mamu, is one such former usta now on the lam. Mahamu is believed to be the mastermind behind the January 4, 2004 incident. He fled to Indonesia last year, sources said. While it is believable that some ustas are involved in the conflict, the military’s campaign to denounce religious teachers as prime suspects is a risky business that can easily backfire. False accusations against religious teacher by the military can lead to yet more violence. Nearly 80 per cent of the current students in the deep South attend Islamic religious schools, which are subsidized by the state on a per capita basis. Worawit Baru, a community development expert at Prince Songkhla Univserity in Pattani, has long advised the government to improve the curriculum, teaching standards and learning equipment of the pondoks rather than trying to force Muslim children to go to Thai public schools — the traditional incubus for Thai nationalism. While the government is starting to heed the advice (for instance Thailand recently agreed to cooperate with Malaysia in improving the quality of its southern pondoks) it must tread carefully. Over the weekend, concerning the ongoing Islamization of the West, I posed the question “Cui bono?” That is, who stands to gain from what’s happening now? This question is especially perplexing when one considers the process of mass Muslim immigration, which effectively strives to replace the existing populations of low-birthrate Western countries with Third World immigrants. The losers in this deal are obvious — but who are the winners? Except for the Islamists themselves, the beneficiaries of Islamization stand well back in the murky shadows. Check out de Mesquita’s podcasts; he presents and applies the lessons from research which shows the decisions of politicians and rulers, throughout history and currently, are explained by the size of the Selectorate and the “ruling coalition”, which may be a few generals, a nomenklatura, an aristocracy, property-owning males, or a large chunk of the voting public. Idealism and statesmanship are rewarded only when there is a large pool benefiting from Public Goods, whose support is necessary. Fake elections without freedom of information and association don’t count as democratic rule. The World Bank and foreign aid ministries in general have been drawn into a system in which loans, grants, and aid funneled through corrupt governments actively suppress growth and freedom. In this system of analysis, corruption is the essential method of distributing spoils to the “ruling coalition”; it ceases to pay off when the coalition gets large enough that general societal improvement results in prolonged power for the “rulers” — it’s the only win-win formula. But even democratic rulers have the welfare of their closest associates and coalition at heart; lame-duck presidents are famously profligate in passing out goodies to friends and relatives. In the case of dictators, once they get past the first eighteen months or so and get the payola rolling, they stay in power for life — or until they are diagnosed with a fatal condition, like cancer. Then the wolves gather, deposition follows, and a new regime arises. (The Shah, for example, fell only when he was diagnosed with incurable cancer.) The gravy-train coalition suddenly sees the end of the guaranteed payoffs, and everything goes up for grabs. The system, whether in autocracy or democracy, efficiently filters out genuinely ethical and altruistic leaders: they simply would not be able to assemble a sufficient inner support coalition to compete with those who hand out keys to the vault. In unusual emergencies, a power structure desperate for legitimacy might pluck someone like Vaclav Havel from outside the power pipeline to lead, but this is rare. As an aside, I note that we all want power, in the fundamental sense of capacity to make stuff happen. It happens that political power depends on agreement and cooperation and compliance from others, so the tools used fit the context. In this month’s feature essay, Duke University professor of economics and political science Mike Munger looks at the economics and politics of recycling. He examines when recycling makes sense as a way to save resources, and when it appears to be more of a religious act. Along the way, he looks at some of the strange things local politicians have required or encouraged citizens to do when it comes to recycling. If you’re intrigued by this, as I was, you’ll want to pay a visit to the Library of Economics and Liberty and read the whole article. Is Gay-Bashing Again a Religious Crime? Are There Jobs That Swedes Won’t Do?